"I told you I would save both of you." 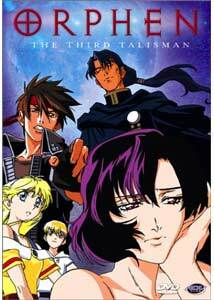 The Third Talisman is the final volume of Orphen, in which the conflict between the sorcerer Orphen, his superiors, and the demon Azalie enters its finale. As things begin, the set-up is relatively predictable. The Tower of Fangs assumes Childman has killed off Azalie, but Orphen, determined to rescue the soul of his old friend trapped within the demon, dispatches Volcan and Dortin to heal the monster with special medicines. His quest has taken him back to the Sword of Baltlanders and familiar ruins as he searches for a way to separate Azalie into demon and human soul. Of course, the trick to all this is the radical weirdness that happened on the last disc, for as we now know, Azalie actually took over Childman's body and vice versa, through a rather cruel trick. Bloody August (Azalie's more colorful name) makes his/her way towards the Tower of Fangs so, oddly enough, their callous attitude towards the demon has backfired since now they'll have to deal with it right up front. Because Orphen doesn't know about the Azalie/Childman confusion, it puts a whole new spin on these last 5 episodes, although, to be honest, it all could have told in more quickly. While Orphen has gotten back on track now, which is nice, it's still too long as a whole series. There were a lot of ups and downs with this show for me, and in these last episodes I can at least report that the problems nicely even out somewhat into something I can generally recommend to people. There was unrealized potential here, there's no doubt about that, but luckily things turn out for the best with a generally enjoyable conclusion. I'd prefer to see these characters shelved for awhile. I have no idea if another series is planned (or another video game, upon which this series is partially based), but I hope not. There's a time when "..and they lived happily ever after..." should just finish some things and, despite my occasional qualms with Orphen, I can say my farewell to the show is a generally fond one. Image Transfer Review: The digitally enhanced footage here looks as perfect as clean as is probably possible with animation. This is mixed, though, with seemingly hand-drawn material that is slightly weaker. There's some grain and markings on the cels themselves that bring out a little bit of fuzziness and artifacting in the transfer itself, though it's nothing seriously debilitating. My only gripe (and this is more with the series than the image) is the awkward use of computer-generated effects on occasion mixed with the rest of the animation. It looks very strange and sticks out like a sore thumb. Audio Transfer Review: The audio track is about as faithful to the soundtrack as previous discs have been. The energy in the front channels is basically good for all action sequences and there's really no complaints. The English track is, however, still plagued with an awful script that not only changes the dialogue too much, but adds in far too many modern jokes and slang phrases. Interview with Japanese crew and cast. Extras Review: The most interesting feature is the 12-minute interview segment with members of the Japanese staff responsible for the original Orphen comic (as published in Japan's Dragon magazine) as well as the anime itself, including Hiroshi Watanabe, the executive director. It's a generally well done piece and accompanies the show quite well. Some of the footage includes a peek at the studios where the cels are actually designed and painted. Since the opening and closing credits have changed in these last episodes, textless credit sequences are presented along with the usual sketches and ADV previews. If you like fantasy-themed animation, the Orphen series as a whole is generally good. Despite some-low points and occasional dependence on extremely poor filler episodes, it mixes serious fantasy with slight humor enough to make things occasionally cheery.